-Ok….Normally I’m a pretty private person per say. One of those “you know me, but don’t really know me” types. I’ve mostly used the blog area for stuff like surveys and jokes and other things that are probably violating ZADOC’S CODE OF MY SPACE -j/k dude (see post in his Blog)……But every once in awhile I’ll post something that’s a little more serious. And I’m posting about this cause maybe someone has an idea/suggestion on this that I haven’t looked into yet…..
-For quite a long time, I’ve been having what I call “headaches”. Basically, they started somewhere between ages 18-21 and have hit me almost every year. 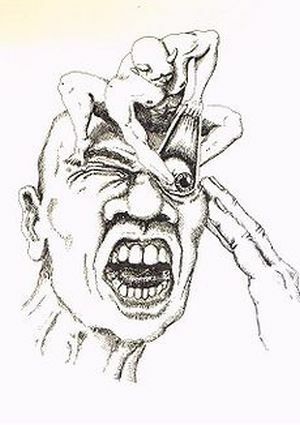 They seem to be akin to migraines-specifically CLUSTER HEADACHES IMHO. I get them on the right side near the temple. They last from 20 minutes to about an hour-and a lot of times the pain kinda lingers around for awhile after that. The blood vein above the right temple is enlarged and pulsing faster than normal. The pain is like a razor on a nerve-like a stabbing pain actually. One way to picture it is like someone with a soldering rod jabbing it into the right side of my temple.. At times it spreads to areas like behind my ears,around the eyes. my teeth/jaws and even my throat every once in awhile. The pain intensity has been from irritating to being so bad that I have withered in pain on the ground. They do seem to hit a little after 10 AM as of late, but many times there’s no pattern.They can hit basically at any time. They have hit me even when I’ve been on stage performing. I have tried to trace a pattern but I’ve been out of luck as of yet. The only one that seems to be like a pattern is they lately seem to hit between the transition of winter-spring and fall-winter. -As of late, I’ve been leaning towards the theory that this might be sinus related. To compound things, I’ve also been having dizzy spells-but only rarely. I got hit with one last night in fact. It feels like my energy is being sucked right out of me. Maybe that’s low blood sugar? It’s been suggested that if it’s sinus, then this dizziness might be from my “inner ear”. -In addition, as of late, I’ve been bogged down by pressures at work, stress, dealing with problems in the band, and not sleeping well. Been having nightmares as of late actually. I know-the 1st thing people will suggest is for me to relax. I do know what my limits are and the value of rest. I do take breaks and sometimes I’ll even nap a little in between stuff. The weekend is usually a good time for me to “recharge my batteries” but as of late it hasn’t been as effective as it should be. Even when I don’t have to do anything the next day and I can sleep as long as I want, I’ll wake up early and stay awake. I don’t want to just sit around doing nothing so I might as well get some work done. -One suggestion of the source of the “headaches” was caffeine, but I’ve eliminated quite a lot of it from my intake. I don’t even drink Diet Pepsi anymore (unless there’s nothing else). It’s mostly Diet 7Up (which has no caffeine or even aspartame), water, or Diet Lipton Green Tea-which I don’t drink much of. And I do have a small cup of Green Tea in the morning. But I still get hit with them….. Admittedly, I haven’t been watching my diet/working out anywhere near like I should as of late-don’t know if that’s a factor or not. I would surmise that it’s probably a couple things together interrelated that are causing the problem. -I was given medication awhile ago, but the 1st time I took it, the side effects made me feel like my head was swelling AND it triggered a very intense “headache”. The 2nd improved version was better, but it still did no good if the attack was already going. The best time to take a pain pill is right when you seen it’s coming. It takes awhile for the pills to dissolve. -If it’s a migraine, there is no cure for it. I have a feeling I’m just gonna have to deal with it cause it’s not going away. I don’t know….one of the reasons I decided to write about this here-maybe someone might have a suggestion that I haven’t explored. There’s some more to add but I’m tired & I’m going to bed. Thanks for listening to me rant and have a great week everyone! This entry was posted in HEALTH and tagged cluster headaches, head pain, headaches, Health, Johnson, My Space, Wayne, wayne w johnson, WWJ, Zadoc. Bookmark the permalink.